Larry Ellison and Russell Coutts have surprised me a few times already. But shutting down San Francisco Bay? Now, that’s a trick. And that’s the plan for America’s Cup 34. According to John Craig, Principal Race Officer of America’s Cup Race Management, the TV-pleasing 45-minute races they envision will have the bay all to themselves. Well, themselves and a spectator fleet, however that gets worked out. South shipping lane. North shipping lane. The Golden Gate Strait beyond the big red bridge. All for a boat race that could well include a big lap of the entire West Bay. A 45-minute race, with some talking-head time before and after, fits broadcast priorities to a T(V). 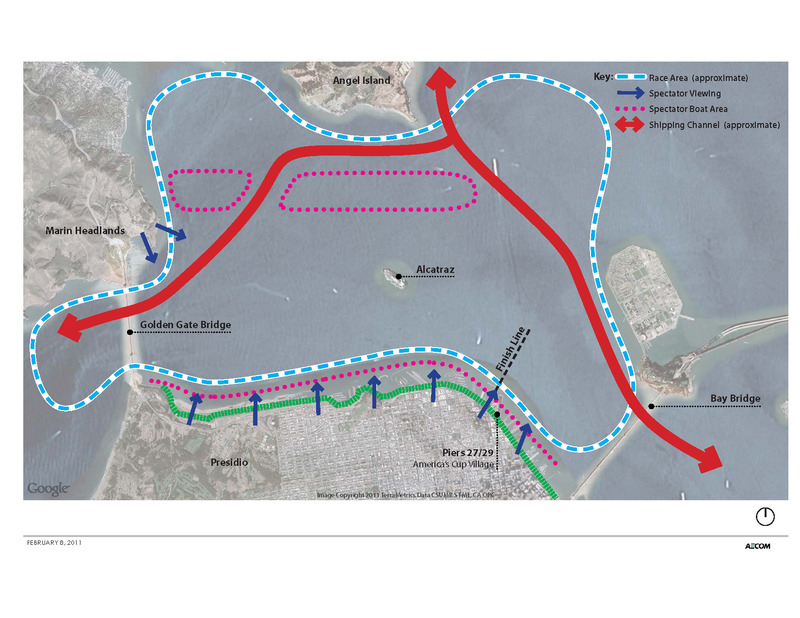 Then, between races, the shipping channels will re-open for traffic. And then, on multiple race days, the bay will close again, for the next race. And so on. That’s the plan. I’ve heard that money talks, and a (conservatively) projected revenue drive of $1.4 billion to the region apparently talks real good. Inbound heavies can be slowed at sea. Outbound heavies can be held at the dock with departures timed accordingly. North-south traffic in the East Bay should not be affected. Ferries can end-around the racecourse where it approaches the San Francisco cityfront at Piers 27-29. And when we get beyond the eliminations rounds to the Cup Finals, a race might go longer than 45 minutes. That groove in the sidewalk is dug by my jaw, dragging. 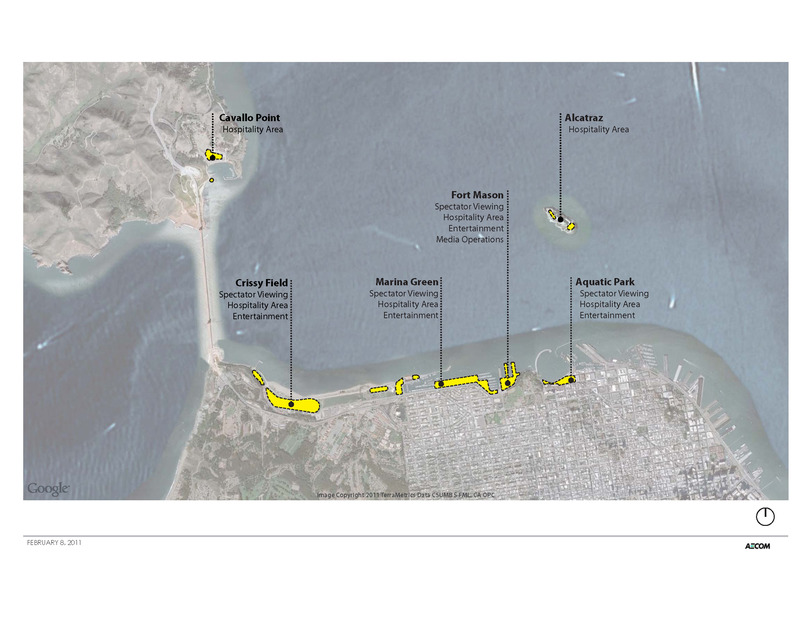 Note that there is a designated spectator-boat area lining the SF cityfront. That works, because the AC72s, daggerboard-down, will be too deep to work close to the beach. Would it have been harder or easier then? Less ambitious, for sure—conventional monohulls, and no mandate to reposition sailing in the world of sports—but with no Automatic Identification System, far less communication among the stakeholders, and with far less ability to herd and manage the floating spectators. Of whom I will not be one. Or at least, not often. There is a lot of talk about how best to view AC 34 on SF Bay. Some still imagine the old days of chasing the boats up and down the course, but, friends, it is not going to be that. Not many of us own motorboats fast enough to keep up with 72-foot catamarans, and I sure don’t see the Coasties or Race Management permitting a stampede of those that do. 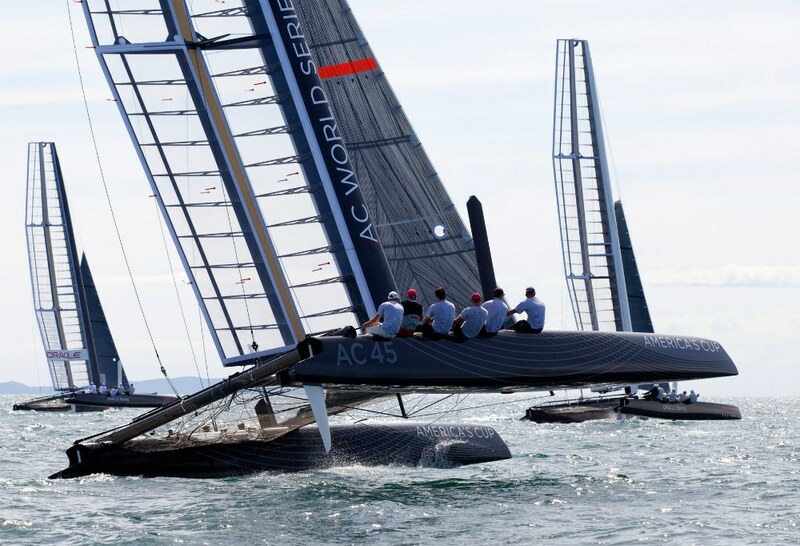 There are tests and demos soon to come in Auckland, using the new fleet of one-design AC45 catamarans, that will give sailors, race committee personnel, and umpires a glimmer of what they’ve got themselves into. Then they can begin to configure a racecourse. And they can tell us just how it feels to experience those closure speeds. But until we have the real-deal AC72s on the water in 2012, Race Management can’t begin to commit to a course configuration. Alcatraz could be a mark of the course (there may be bleachers on The Rock) and Sausalito’s Cavallo Point is touted as prime viewing; it’s certainly more accessible to more people than the south side of Angel Island. Doglegging beyond the Golden Gate Bridge will, I am sure, be at the PRO’s discretion, there being days in that patch of water that would be highly unwelcoming. And any racecourse will be dynamic. There won’t be any anchored buoys. 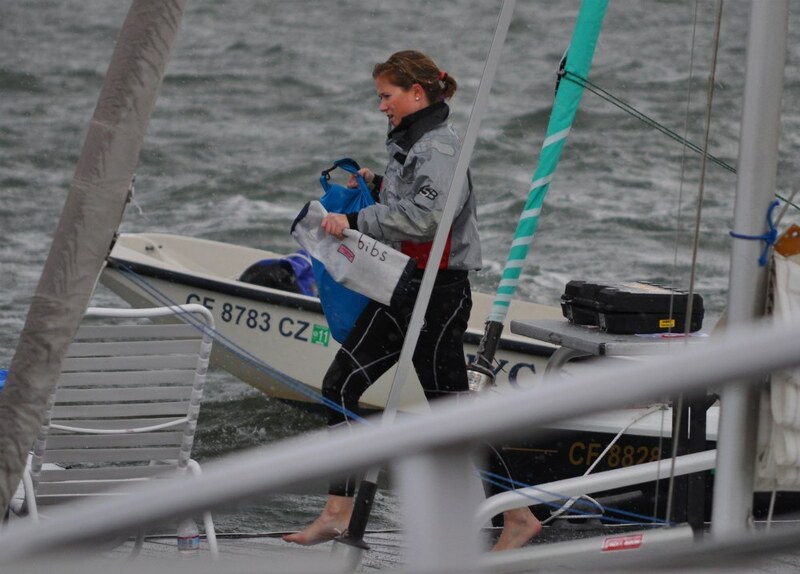 Marks will be boats or equivalents, with the length of critical legs adjusted for the sake of timing. Mike Martin should be familiar to readers as the only person who has ever won the 505 world championship both as crew and as skipper. Teamed with Howie Hamlin, he has also won the 18-foot skiff championships in Australiaa unique accomplishment for Americans. 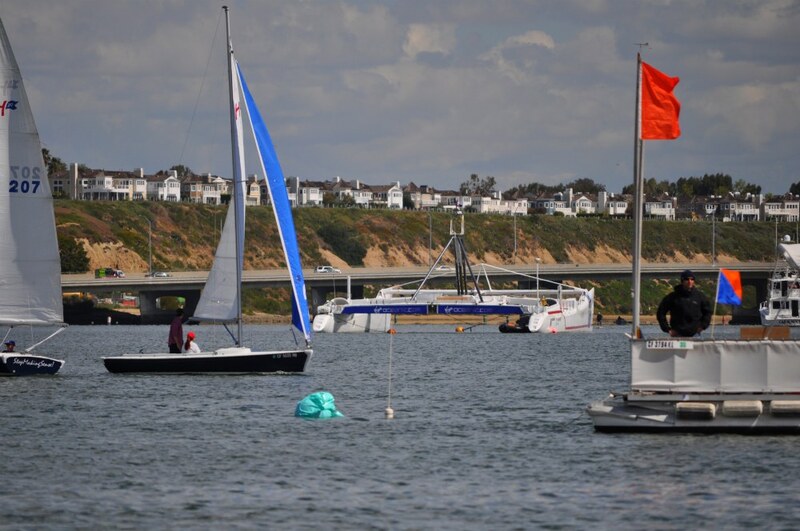 Mike popped up last weekend at the Baldwin Cup team races at Newport Harbor Yacht Club, where the ultimate winner was New York YC’s team. Surprise (!) for about five minutes there, we had hail . . . 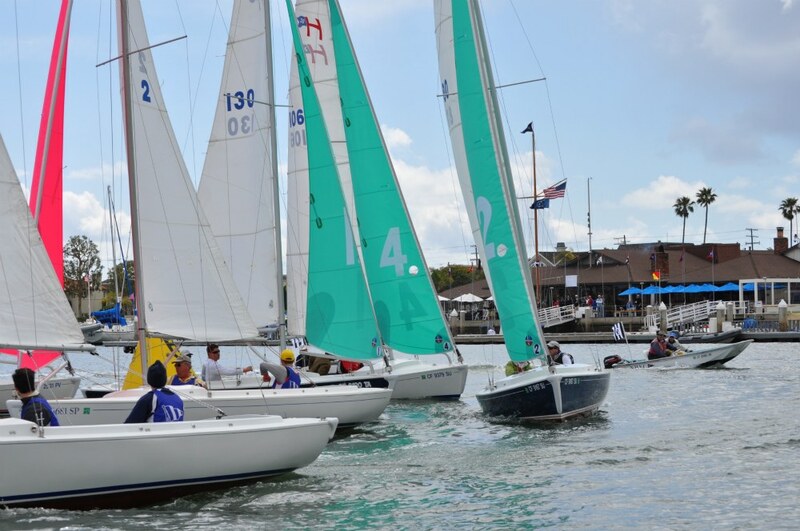 The races are run in a very nifty fleet, the Harbor 20. There’s easy viewing from NHYC, which shows up in the background . . .
And there is a lot of story in this otherwise-middling image below. For starters, note the colorful floating garbage bag. To make Baldwin Cup racing possible, NHYC clears the nearby harbor of all of the many moored boats that live there, normally. This bag marks a mooring that a boat will have returned to, by now. There are dozens and dozens of them scattered about. And the big thing in the background is Cheyenne, ex-Playstation, once the late Steve Fossett’s record-setter under sail, since repurposed as a camera platform for Roy Disney’s movie, Morning Light and more recently as a tender for a submarine originally commissioned by Fossett from Graham Hawkes. Fossett’s plan was to dive to the deepest place in every ocean on earth. 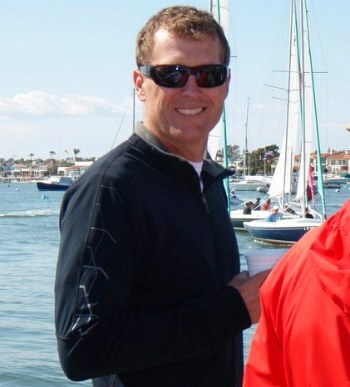 Now the sub belongs to Chris Welsh, better known as the owner-skipper of that all-time great ocean racer, Ragtime. Chris, with sponsorship from Richard Branson and a sharing arrangement, plans to follow through on Fossett’s plans. After Transpac on Ragtime, of course.